My name is Peg Cheng and I'm a writer, solopreneur, and Prelaw Guru living the fab and frugal life in the city. I started this blog to chronicle how I'm learning to buy less and live more. My core values are creativity, service, humor, compassion and frugality. If I could not live these values, I would be unhappy, I would be lost at sea. Thankfully, I am able to live these values pretty much every day and they’re reflected in how I spend my time and money. What are your values? Are they reflected in your everyday life? Don’t spend more than you earn. Simple way to live free and stay out of debt. What this means is put a specific amount of money away into your retirement account and your savings right when you get paid. Then, live off the rest. I admit that I’m good at putting away for retirement but not always for savings. It’s something I’m trying to get better at. Truth be told, I do order some things online that I can’t get in stores. It makes me feel better that when I do this I’m using a credit card that gives me points (which I’m saving up to trade in for a flight to Europe). But on a daily basis, I use cash for my purchases. It’s the simplest way to avoid debt and understand the value of the dollar. Marcus and I take out a specific amount of cash each month for groceries, supplies, going out, etc. When we run out of cash, we stop spending. If you’ve never done it before, try it for a month. You’ve got nothing to lose and only knowledge to gain. I don’t like having a lot of things and the things that I do have, I want to be things that I love, that will last a long time. As William Morris said, “Have nothing in your houses that you do not know to be useful or believe to be beautiful.” You tell ’em, William. Buying quality means I might spend more money up front, but I will spend less money in the long run because my things will last longer. If you don’t believe me, you need to go to a Goodwill in a rich or well-off neighborhood. You wouldn’t believe all the great stuff people donate! Of course, don’t buy it just because it’s cheap. Buy it only if you need it. When in doubt about something you want to spend money on, ask yourself, will this improve or preserve my health? If yes, go for it. Your health is the most important thing. Without it, you’re either dead or miserable or on your way to one of them. I shouldn’t have to explain this, should I? Okay, fine. The relationships you have with people you love matter more than money and things. If you find yourself surrounded with money and things but not good people, then it’s time to change. Stop spending money and instead, spend time with people that matter to you. That’s it. That’s my manifesto. I hope you find it helpful to your own frugality journey. 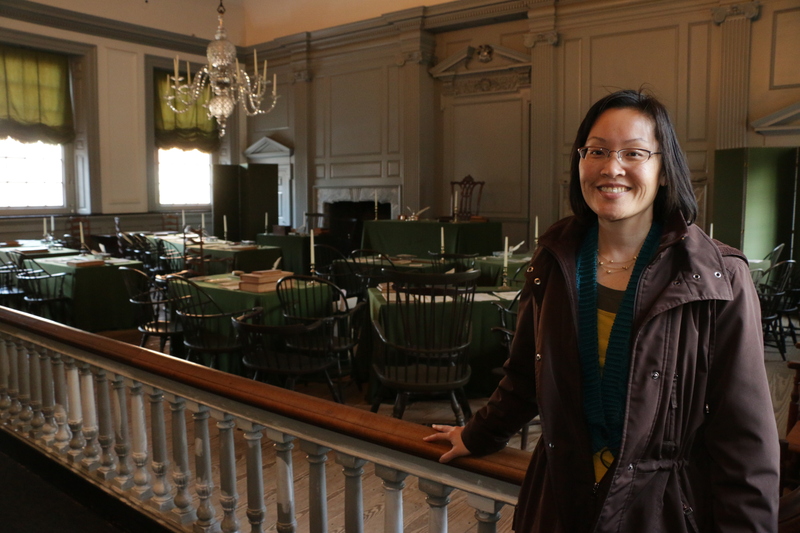 It seems appropriate that I include a photo of myself standing in Independence Hall in Philadelphia, at the site where our founding fathers debated the Declaration of Independence, for my last post for Super Frug. I mean what is the Declaration of Independence but a manifesto for our nation? Yes, Super Frugers, you heard that right. I’ve blogged about frugality and the joys of buying less and living more for the last three years. I enjoyed writing all these tips and I hope you enjoyed reading them. Now it’s time for me to move on. Curious what I’m up to next? Go here for my latest projects, passions, and gigs. I wish you all the best, now and always! I’ve never had a green thumb. When I was younger, I’d water my mom’s garden and help her kill slugs, but I just wasn’t that interested in gardening. When I got my own place, I didn’t buy plants. Just couldn’t be bothered even though I’ve always enjoyed looking at flowers and plants. Sometimes, someone would give me a plant for a gift and I’d take care of it. Some lived, some died. C’est la vie. But then I met my husband Marcus who has a thumb so green that his hand could pass for the Incredible Hulk. Marcus can turn a dirt patch into an oasis; a stick into 20 pounds of wine grapes; and a sliver of a leaf into a 3-foot tall aloe vera with arms as thick as a human’s. When we moved into our townhouse back in 2008, it had no yard, just a wooden deck. But Marcus didn’t let that stop him. Over time, Marcus transformed our deck into a lush garden, replete with all kinds of plants, flowers, and edibles; including pitcher plants, hostas, fuchsias, a sprawling grapevine, raspberry bushes, and large pots of climbing hops. But the one thing that was hard to grow was vegetables. After building his own planter box that was as big as a coffin, Marcus spent several years trying to grow tomatoes, brussels sprouts, pumpkins, cucumbers, watermelon and more. 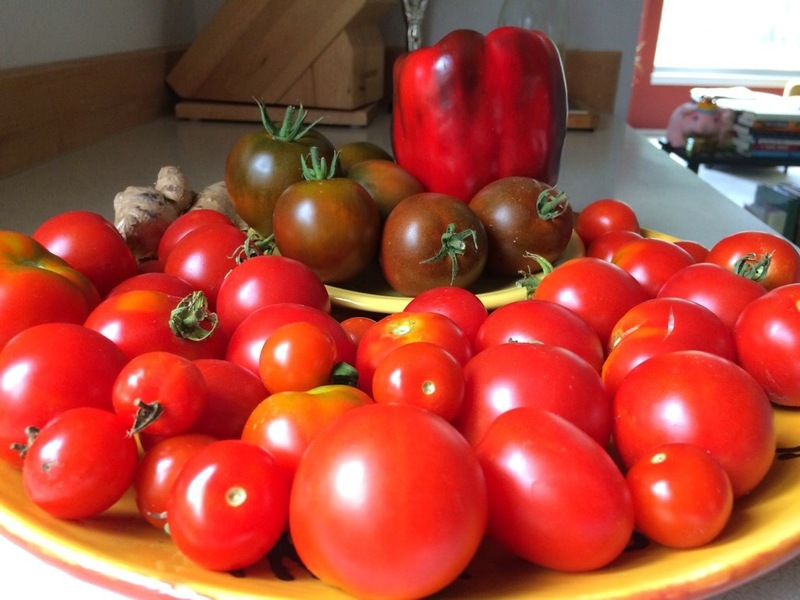 We had one good year of tomatoes but most years, not much at all. So, we applied for the City of Seattle’s P-Patch Community Gardens Program. It’s a screaming good deal. For less than $50 and eight hours of volunteer time per year, you get a garden plot to call your own (and free water!). The only thing is the wait list is very long. But we were patient…and two and a half years later, we got in! I decided then and there that I would learn to garden. We would do it together. 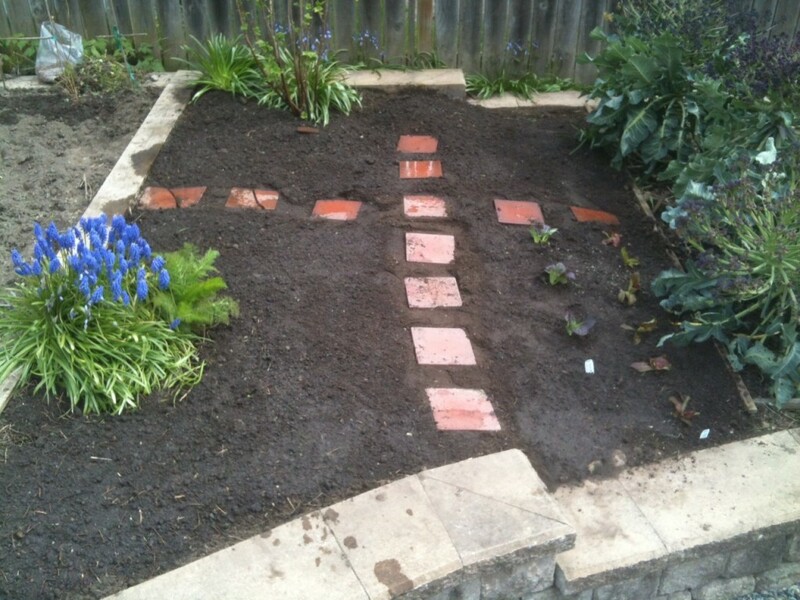 Here’s what our patch looked like after we weeded it and put tiles down for stepping on. There’s also some radicchio starts on the right hand side. 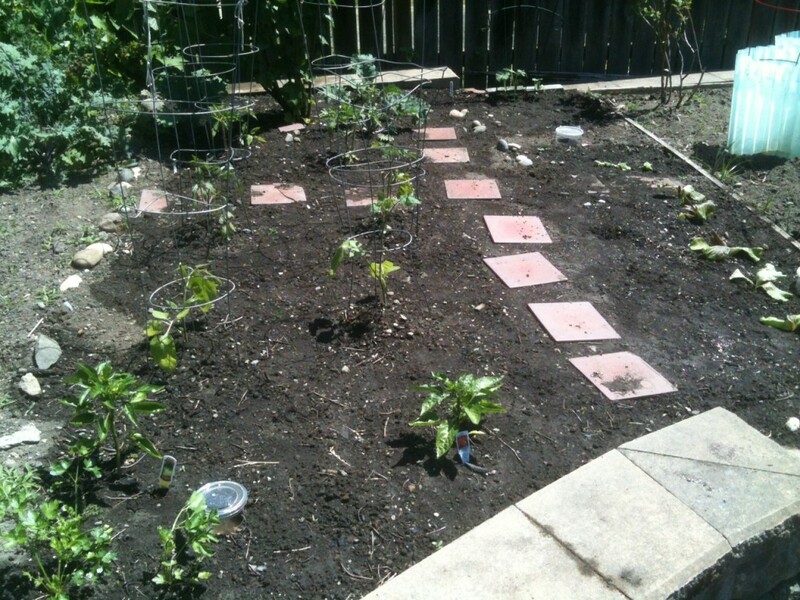 Here’s what our patch looked like after we removed the grape hyacinths and planted our first starts of tomatoes, peppers, lettuce, kale, cucumbers and parsley. 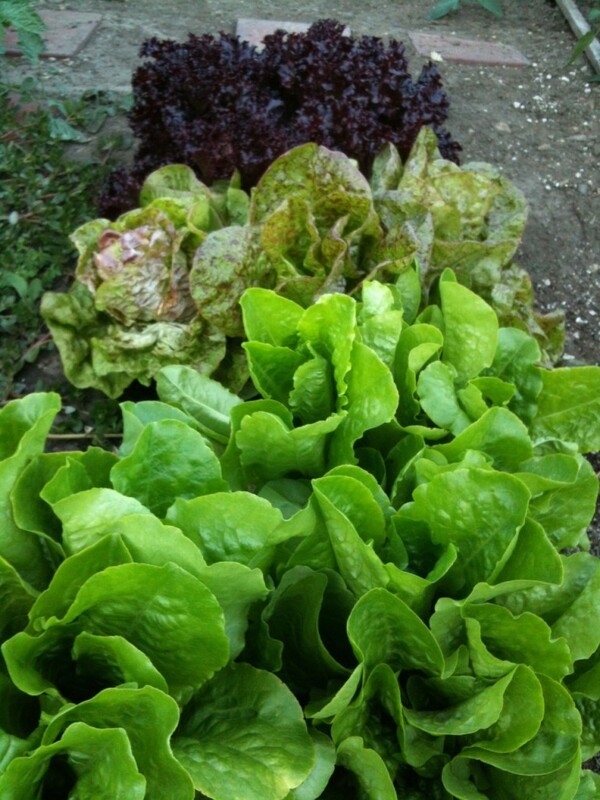 We received our almost-100-square-foot plot at the Thyme P-Patch in April and after a month or two, we were harvesting lettuce! Let me tell you–fresh is so much better than store-bought. Pretty soon, we were cutting our produce shopping at the grocery story in half! 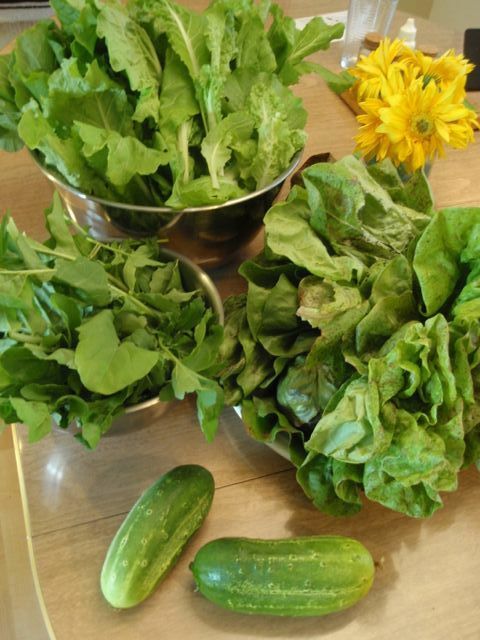 A typical weekly bounty from our patch is pictured above: buttercrunch lettuce at the top, butterhead speckles lettuce on the right, cucumbers, and arugula on the left. In just a little over four months, I’ve learned a lot about vegetable gardening. 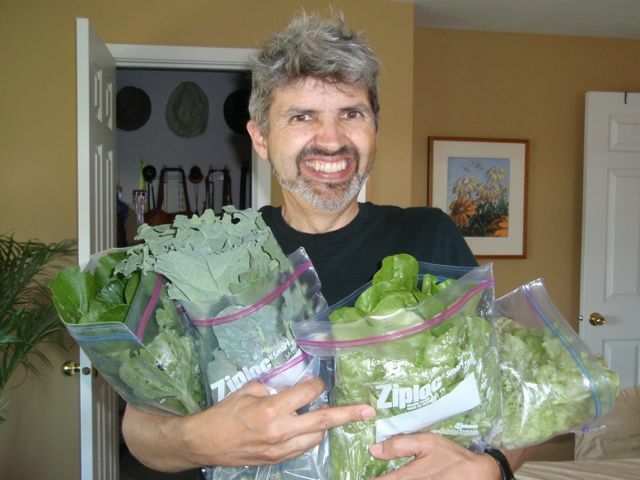 Like how you should stagger planting your lettuce starts by a week or two so that you always have fresh heads to harvest all summer long. Thanks to fellow P-Patcher Mark, I learned how to make slug traps out of old yogurt containers and cheap beer. 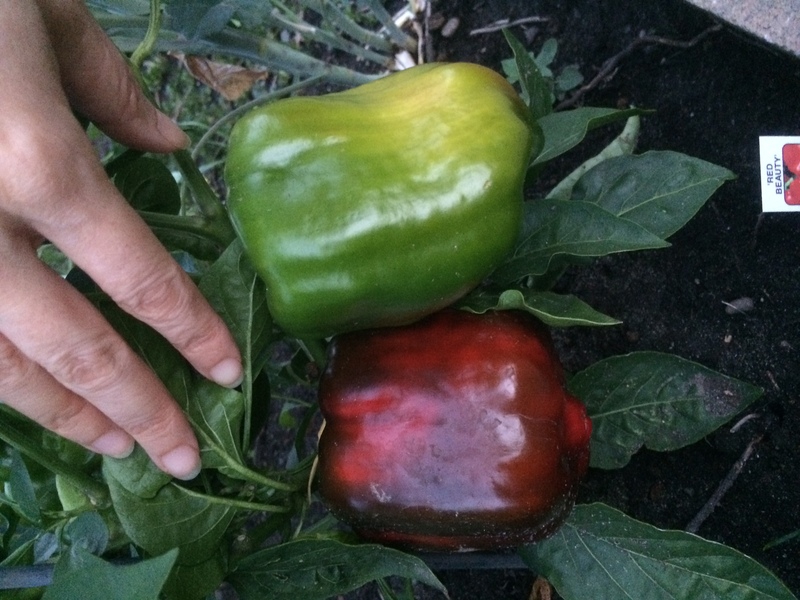 Also, I had no idea that it would take nearly 120 days for bell peppers to ripen and turn red. But what beauties they are when they do turn! 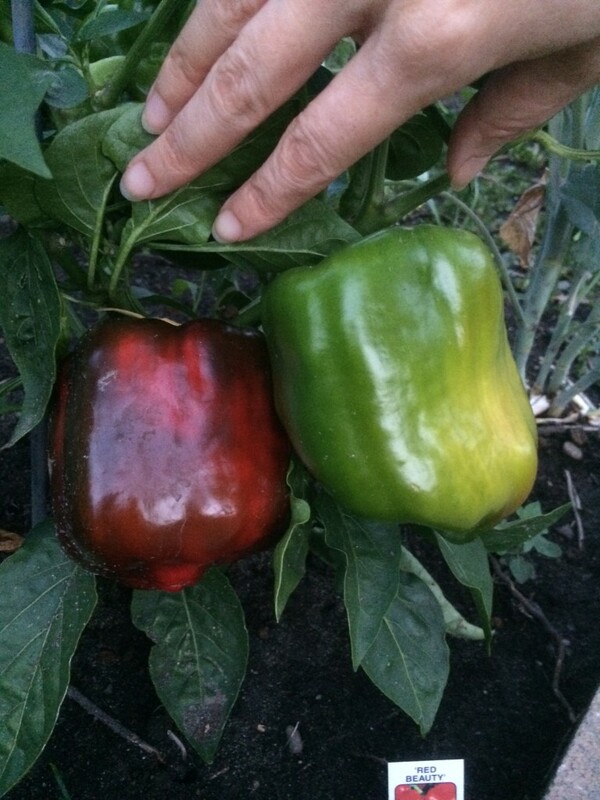 Speaking of beauties, here’s one of our red bell peppers with our bumper crop of Uncle Wilf Tomatoes and Black Russian Tomatoes courtesy of fellow Ballard gardener Krazy Kate who sells her precious tomato starts one day a year in May. 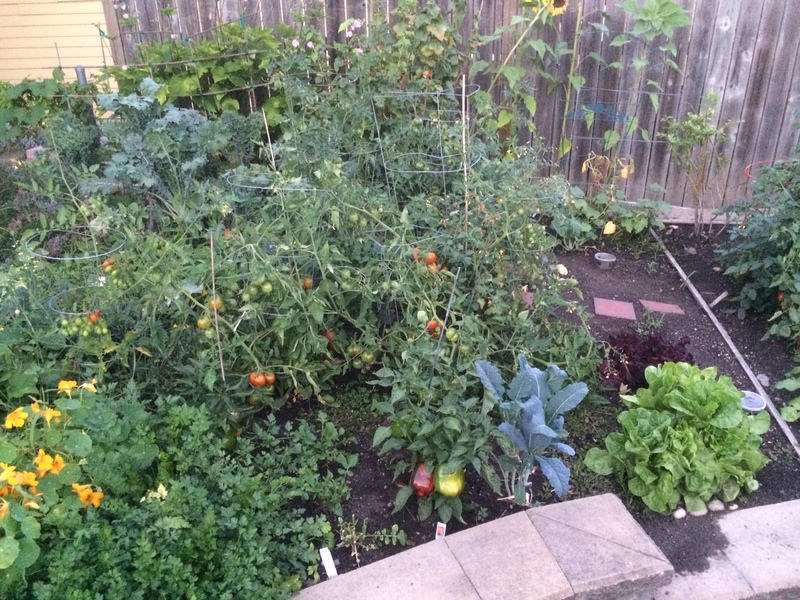 Most importantly, with our new P-Patch, my gardener husband is really happy. Finally, at the ripe old age of 42, I can officially call myself a gardener. ps. 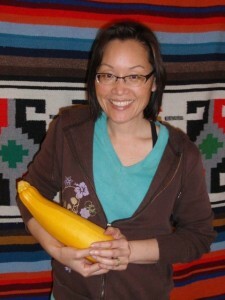 The yellow squash “baby” I’m holding in the first photo was gifted to us by a fellow P-Patcher. Thanks, Shannon! Being frugal isn’t just about how little money you spend on things, it’s also about developing healthy habits or practices that benefit you, and will ultimately help you save even more money, in the long-run. 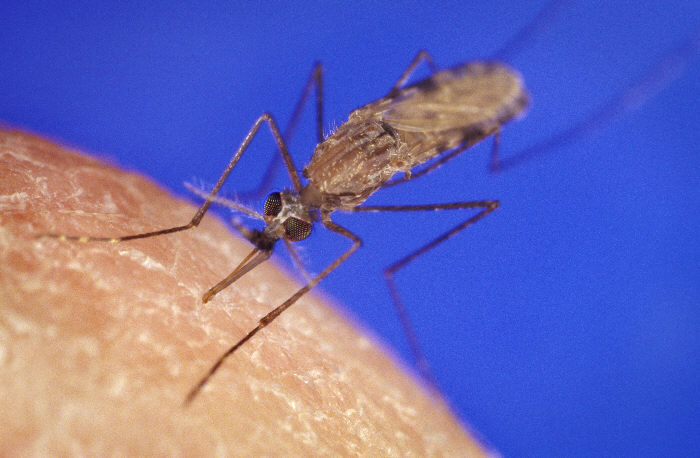 As the old saying goes, an ounce of prevention is worth a pound of cure. As someone with hay fever and other allergies, I don’t use fragrances in my home and I avoid them in my products. But sometimes, I can’t avoid them. For example, I bought some clothes at the Goodwill recently and they smelled very strongly of laundry detergent. When I got home, I washed the clothes as I usually do. The smell was still there. I washed them again. Smell was still there. Washed it again. And again. It took washing the clothes 3-4 times for the fragrance of the detergent to finally lessen! Because if I wear a piece of clothing that smells of fragrance, I get headaches. I wasn’t always like this. I grew up using Tide, Cheer, Irish Spring soap, Tone soap, Flex shampoo, Pert shampoo and other heavily scented detergent and soap products (though I’ve never seen Barf detergent). I thought something wasn’t clean unless it smelled like flowery stuff. But, as I got older and as my seasonal allergies got worse, I started to eliminate fragrances from my home and personal products. The more I decreased fragrances in my life, the more my allergies decreased. Research studies on fragrances in products have found that they contain chemicals that are UNLISTED but also some of which are known CARCINOGENS and are HAZARDOUS to your health. Here are two studies on the hazards of scented products conducted by the University of Washington. Also, if you like to wear perfume, cologne or scented lotions, you’ll want to read this article in Scientific American called Scent of Danger. If you have seasonal allergies, sensitive skin, chronic headaches, asthma and/or other respiratory issues, consider removing all fragrances from your home and personal use. Try this for a month and see if your daily health improves. I’m no scientist, but I bet you will feel much better. So, don’t just buy the cheapest soap, detergent and/or shampoo to use. Look for products that have no added scents or fragrances. It might cost a little more money now, but your health will benefit for many years to come. ps. 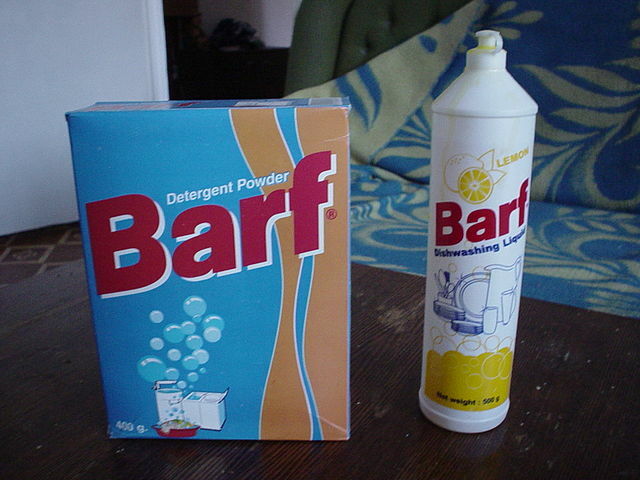 In case you’re wondering, Barf soap and detergent can be purchased in Karaganda, Kazakhstan. Sometimes too much of a good thing can be a very good thing. 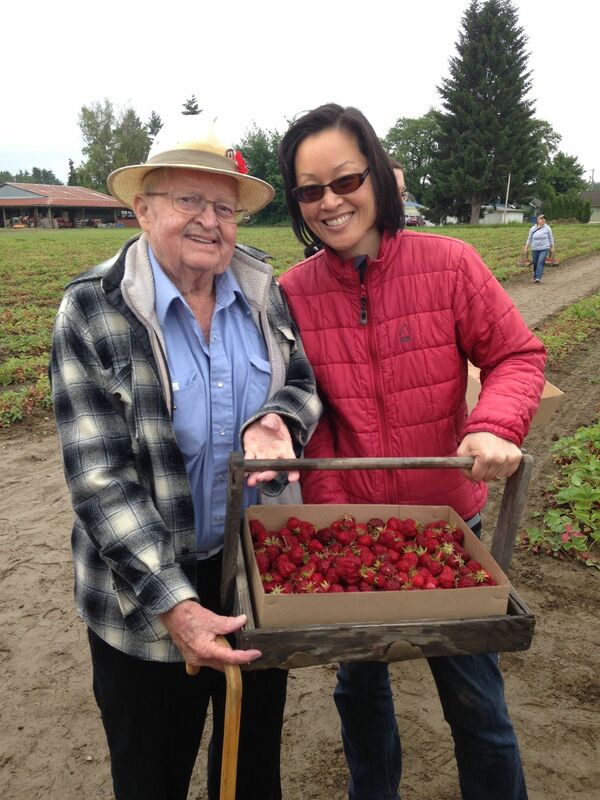 Last weekend for Father’s Day, Marcus’s family and I took my pop-in-law Mr. Mark to Harvold Berry Farm. This U-Pick farm is a favorite of Marcus’s family. 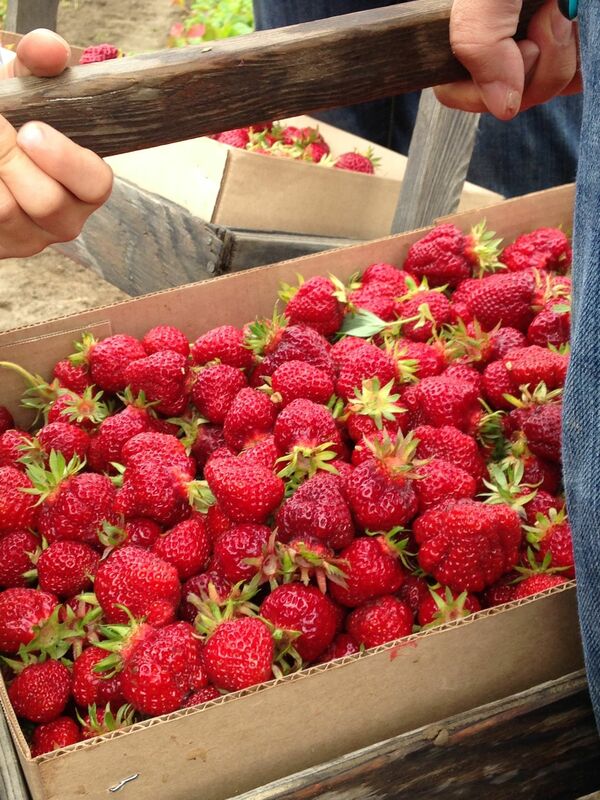 You can pick (and eat) as many strawberries as you want for $1.25 per pound. Mr. Mark watched us pick because his knees just aren’t what they used to be. In less than an hour, Marcus, Char (Marcus’s mom), Logan (our nephew), and I picked 21 pounds of berries! We filled two big baskets like the one below to the brim. My sis-in-law Christy took these great photos when we finished–very muddy, but happy. Your back and thighs get a little sore bending over and crouching the whole time but you forget that when you see how beautiful the berries are. Strawberries this ripe need to be eaten, cooked or frozen right away. After eating some fresh ones at the field and then later at Char and Mr. Mark’s place, Marcus and I took 11 pounds home with us. 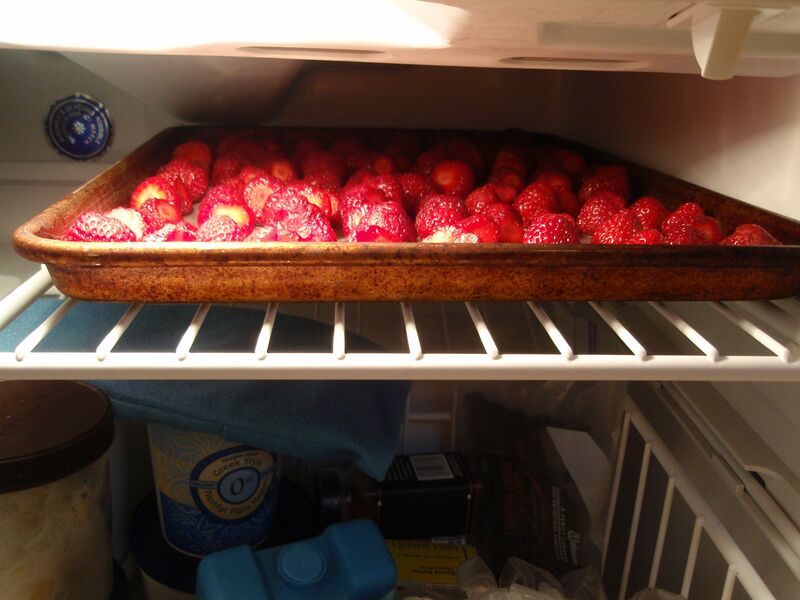 Because we want to have strawberries year-round, we decided to freeze our bounty. 1. First, fill a clean bowl or bucket with cold water. 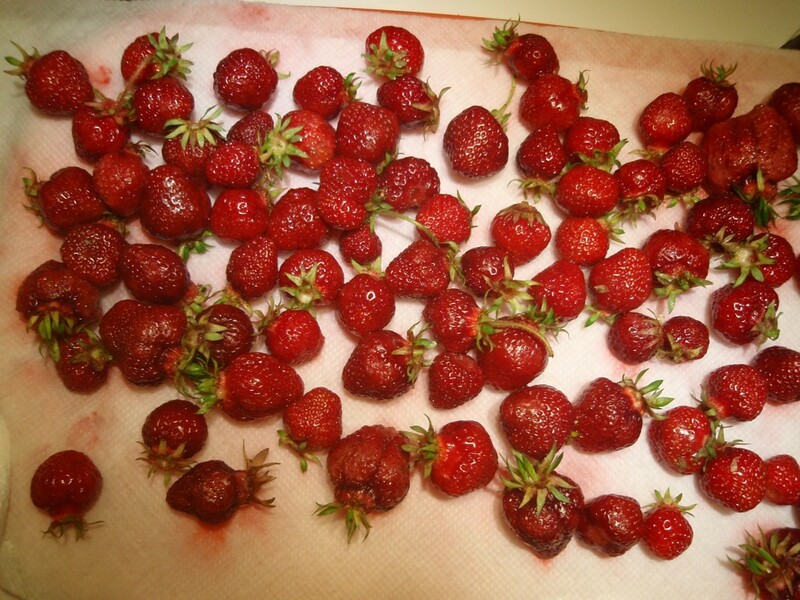 Place berries in the water and gently swish until you get all the dirt off of them. We had to do this several times as we had a lot of berries. 2. Lift the berries out of the water (do not drain them into a colander or else you’re dumping dirty water right on top of your clean berries!) and place them on cookie sheets lined with several sheets of paper towels. 3. Pat them dry with paper towels. Do not skip this step! If you don’t dry the berries, they will stick to the cookie sheets when they freeze. 4. 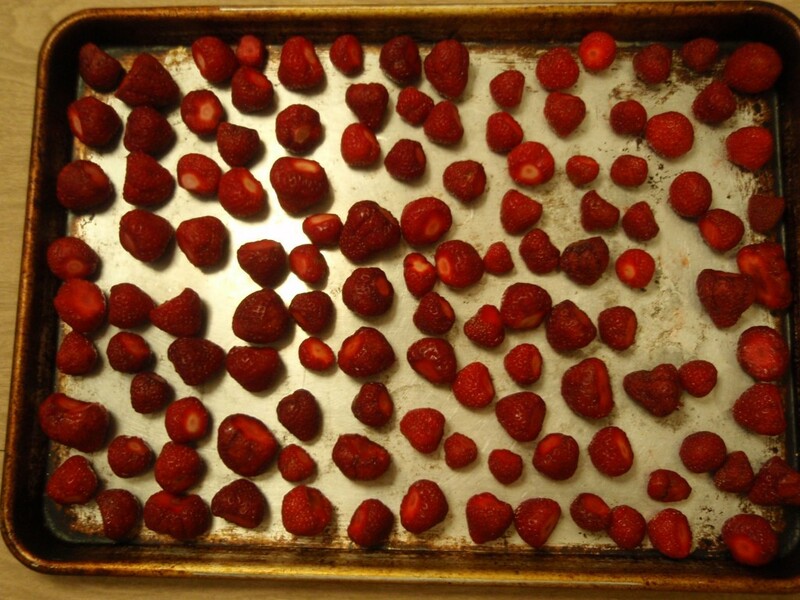 Next, place the dry, clean berries on unlined cookie sheets. 5. Then, place them in the freezer for two hours. After two hours, check them to see if the outside of the berries are cold and dry. If they still feel tacky or a little damp, freeze for another half hour and check again. They should look like the berries on the left when they are fully frozen: dry, cold and hard. 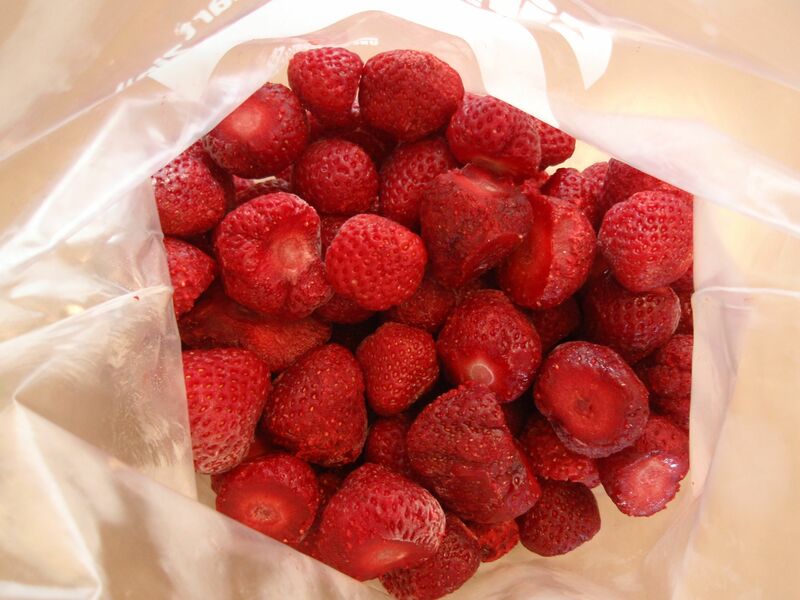 Place the berries in freezer-safe tubs or freezer bags and store in your freezer. Our 11 pounds of frozen strawberries will last us from June through December and they only cost us $13.75! So, next time you have the chance to purchase ripe fruit in season, and at a good buy, consider buying more of it and freezing it. With just a little work and effort, you’ll be able to enjoy the fruits of your labor (pun intended) throughout the rest of the year! Top two photos at Harvold Berry Farm by Christy Rainchild. Sticking it to The Man!